The most popular apps made in Berlin include a few surprise names, judging by a new report from Berlin app search firm Xyo and sister analytics company Priori. 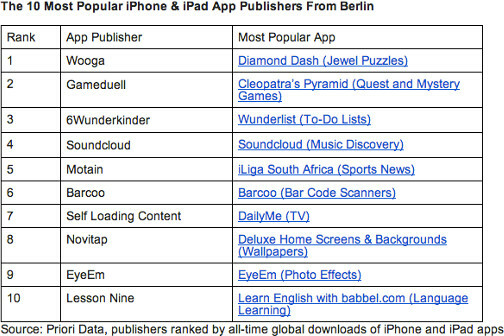 The two companies teamed up to trawl available data and came up with a list of over 50 publishers with 400 apps for iPhone and iPad “made in Berlin”, which together have been downloaded an estimated 140 million times since launch. Wooga topped the list of most popular publishers by downloads followed by fellow game publisher GameDuell, 6Wunderkinder, SoundCloud and football app maker Motain, which in May raised a €10 million Series A round from Berlin venture capital firm Earlybird. Most of those names are familiar. Some publishers further down the list – Novitap, a publisher of various wallpaper apps, and Self Loading Content, which makes TV app DailyMe – are less frequently mentioned. To produce the report, Xyo put together a list of all the companies on Berlin Startup Jobs and the Berlin Startup Map then sent it to Priori, who compared it to its list of active publishers and generated the ranking list. Priori’s data is drawn from public information including financial statements, published app store top charts and third-party research as well as data direct from partner app developers. The two companies deliberately decided not to include estimated download numbers. “We felt this would de-focus from the core message – that the overall Berlin app economy is alive and kicking and that these are some of the Berlin companies behind it,” Xyo cofounder Matthaus Krzykowski said. It’s easy to give estimates for some apps and publishers, though. In September 2013, Wooga said Diamond Dash had reached 33 million downloads for iPhone and iPad. 6Wunderkinder’s Wunderlist is now at five million users (which, if they’re active, is a much more meaningful measurement of popularity) and Motain is currently sitting on about 10 million downloads and 4.5 million active monthly users across its various football apps. 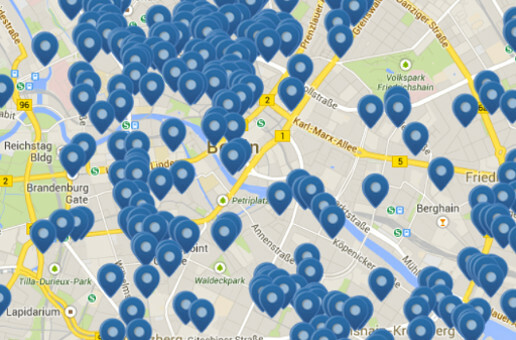 Xyo stressed that the true number of apps from Berlin is likely significantly higher. The report didn’t include companies who are not listed on the Berlin Startup Map, did not post on Berlin Startup Jobs or – like Clue – have only just released an app. The report is also limited to companies who’ve built their own apps not those who’ve created apps for others. Examples of leading app and design agencies in Berlin include Nxtbgthng, Novoda, Edenspiekermann, CodeKollektiv, Iconmobile and Fjord.